After we had a light lunch on the day of our arrival at Grootbos, a guide came over to chat to us about which of the activities at Grootbos we wanted to do during our stay. 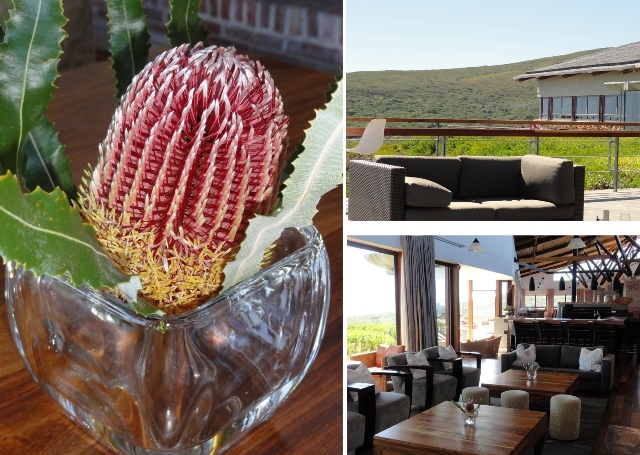 There is no shortage of things to do at Grootbos and many of the activities on offer are free of charge. As many of the activities overlap, you might want to set aside more than 24 hours for your visit to the nature reserve. In the morning you can chose to do a forest and fynbos walk; a 4 x 4 reserve safari (which is what we did); horseback riding or a beach walk. 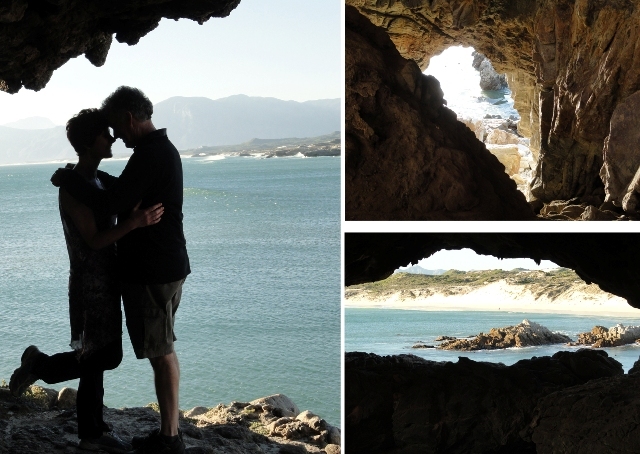 In the afternoon you can take the social responsibility tour; go to the ancient caves (our choice); horseback riding or a walk through the milkwood forest. The bird life is amazing so if you are a keen bird watcher do remember to bring your binoculars with as there are 680 bird species to be found here. On offer at an additional cost is the option to plant a tree (R350), shark cage diving (R1400), a flight over Walker Bay (R3500); Eco Cruise (R600/adult R450/child), beach horse riding (R650) or a visit to the Bloom Salon. Dave and I have been on a cruise to watch the whales in the bay and I can really recommend this. The salon was a bit out of my price range so I did not even consider it and we did not go and take a look at the facilities. 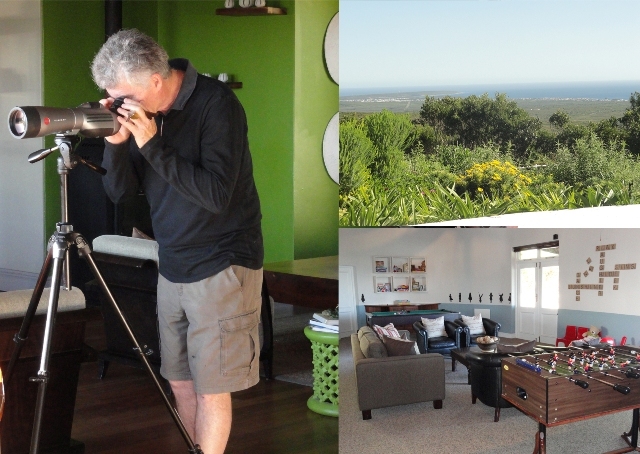 Grootbos also have a house at De Kelders and from there you can do land based whale watching while enjoying canapés and champagne. The visit to the ancient caves was guided by Jo who is amazingly well educated about the area and botany. The caves are a combination of Table Mountain sandstone and Bredarsdorp lime. We got to experience the fresh clear water of an aquifer while sitting on the beach and one cannot help but wonder how amazing the San were to have worked out where they could get fresh water from. As we were walking I did not take many notes and I am going to leave some of the surprise of what the caves have to offer for when you visit! Our botanical tour was led by Bongani. The views around the reserve are spectacular and this was the reason the current owners purchased the property, which used to be a cattle farm, in 1993. We saw a rooikat (caracal – literal translation is red cat) running through part of the 2500 hectares that make up Grootbos. The area is also home to poisonous snakes such as the boomslang (tree snake), puff adder and cape cobra. We saw an angulate tortoise and a few lizards on the pathways leading to our lodge. Thankfully we did not see any of the rain spiders as even though they are harmless, they are not pretty. There are 6 types of antelope on the reserve and we were teased by a klipspringer (rock jumper) while on our tour. We did not come across any of the other species that reside in the area such as the cape leopard, grey mongoose, porcupines and baboons. There are 750 species of fynbos (fine bush) to be found on the grounds and Grootbos have their own hives. In my mind there is nothing better than fynbos honey and it comes a distinct first in comparison to heather honey from Scotland. Fynbos needs to burn every 15 – 20 years in order to grow and in 2006 a huge fire in the area took out the Forest Lodge as well as large tracts of fynbos. 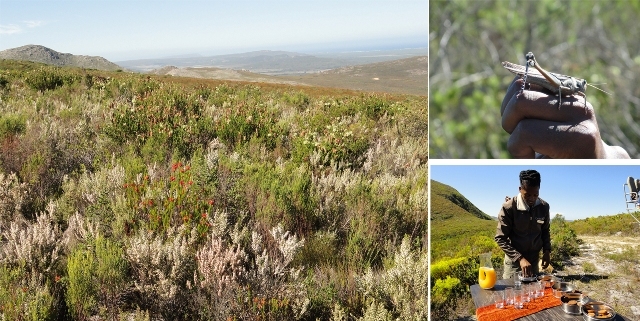 Fynbos will grow for 7 – 8 years after a fire and then lie dormant until the next fire. They self seed and the seeds are dispersed by wind and lie underground waiting for the heat of the fire to activate their growth. The smoke from the fire and the ash are very important and it is the ash which provides nutrients after the rain to assist with seedling growth. Our 4 x 4 tour included a tea break with some lovely juice and biscuits and the entire time was amazing. I just love the diverse nature of the country I live in. I learnt so much from both Jo and Bongani and I have a wonderful book on the fynbos of the area which I can use at home when planting my garden. I also have a milkwood tree which has been planted in a huge pot and is in my patio at present. This will be planted in my garden when it is big enough, and every day I shall be reminded of our wonderful 24 hours at Grootbos. I have broken down my experience into three posts. This is the third post. I would’ve chosen just as you did! What a beautiful pic of you and Dave by the caves.